LoraSaysSo! 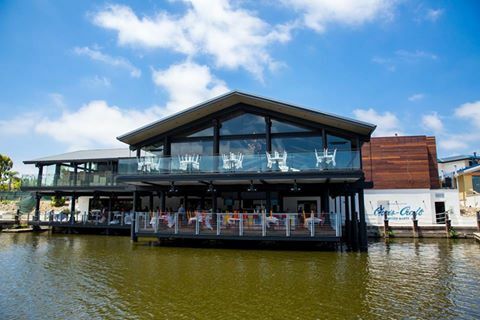 : Decoy Delivers Dockside Dining in San Marcos! My husband and I had the pleasure of experiencing Decoy Dockside Dining at their soft opening recently at the invitation of the chef. Under the leadership of Executive Chef Danilo "DJ" Tangalin, tapped from JRDN, the service was outstanding and the food, impeccable. I have dined on Chef DJ's food a couple of times now (see these posts here and here) and the more I engage with his food and get to know him as a person, the more impressed I am with his talent, work ethic, dedication and humility. Decoy is an upscale lakefront restaurant located at the Lakehouse Hotel and Resort in San Marcos. Currently Decoy upstairs will be open for dinner while downstairs will be open for lunch. They are aiming to start Sunday brunch at the end of September 2016. The food can be described as hunting lodge home-style cuisine revised. The hunting lodge theme is apparent right when you enter the restaurant with the words "OPEN SEASON" greeting you and by the artwork on the walls. A chandelier of buoys adds a splash of color to the ceiling and imparts the "dockside" aspect. A lit onyx background gives the bar character and appeal. The restaurant is airy and huge. Intimate seating for two up to a large banquet style table is available, plus plush couches are available for groups if drinks and bar food is all your party needs. A long banquet table is available for large parties. Bar menu which features lumpia! We had some drinks, the Smoky Mango-rita (a bit too strong for me), the Madre Mojito (forgot to take a picture, but it was delicious) and a Lemon Drop (my favorite of the night)! Although we didn't have wine, something different at Decoy is that they will bring the bottle of wine to you and pour it table side. I observed this happen throughout the night as people were enjoying their glasses. The dining menu at Decoy is high end, with something for everyone. For appetizers, we started with Foie Gras Pate, served with toasted peanuts, basil, seasonal jam and baguettes. Because I had not had foie gras since the ban in California was lifted, I had to order it! The silkiness of the foie gras paired with the crunchy peanuts, sweet preserves and chewy baguette were a perfect combination. My husband is a fan of game meats so he had the Bison Tartare. It contained caper salsa verde, cornichon emulsion, egg yolk vinaigrette, and was served with black pepper flatbread. I'm more of a beef girl, and hesitate to try other meats but I took a bite and.... it tasted like beef, hahaha! My husband was even talking about the dish the next day so I know he really liked it! Decoy also has elk and duck items on the menu too. Chef DJ incorporates his Filipino heritage in the menu with not only lumpia, but also offering bibingka as an appetizer. Bibingka is a rice cake made with coconut milk and cream cheese. Oh. my. gosh. This was by far, one of the best bibingkas I have ever had. I am not kidding. If Chef DJ opened a bakery that sold these, it'd be like Portos and their guava rolls! It was soooo good, I wanted to take a whole one home for my parents to try! The only suggestion I have is presentation-wise, to maybe serve it on a banana leaf or in a small basket or something because all the other plated items were so pretty. For our entrees, we had the 8 oz. Prime Filet Tenderloin served with creamed kale, smoked potato puree, buttermilk fried onions, au poivre. The filet was so tender, cooked just to my husband's liking, medium rare. You could slice this meat with your fork, it was that tender. Those onions mmmm-mmmm...I suggest they offer those as a side so you can get a whole bowl of them! We also had the Sea Bass, served with roasted artichokes, chinese sausage, braised beans and clams. This is one of my favorite fishes. My fork gently parceled big white pieces of the fleshy fish straight into my mouth. I really enjoyed this. The broth was tasty, in fact I wish there was more! If I had some bread, I would sop up the broth with the beans. I didn't care too much for the sausage bits though, too salty and chewy. I think the dish was great enough without the sausage. As a side, we ordered mac and cheese. This had just the right ratio of cheese to pasta. The delicate pasta was not drowning in cheese. My mac and cheese loving daughter would have really liked this. We liked it too, as evidenced by the empty bowl at the end. For dessert, we shared the Brown Butter Blondies, served with salted caramel nut spread honey orange poached figs, purple haze goat cheese semifreddo and candied pecans. Salty, sweet, sour, crunchy, smooth, all the textures covered in this dessert! It was definitely edible art! Overall we had a fantastic dinner service, thanks to Alyssa and all the other attentive Decoy staff! It was a special night out as we considered it our wedding anniversary celebration, 24 years on August 30th! Decoy Dockside is located at 1035 La Bonita Drive in San Marcos, CA and will be fully opened as soon as next week. I'd love to go back and appreciate the lakefront view during the day and also try the Roasted Bone Marrow, the Kung Pao Crispy Sweetbreads and the Tomahawk steak for two!! As you can see, I already have my food selections ready! I wish the restaurant featured an exhibition kitchen so that you can see the chefs work. There is however, a window looking into the kitchen from the outside. I snapped this picture waiting for the right moment and probably seemed like a stalker of some sort, lol! Chef DJ Tangalin is definitely a chef to watch. Follow him on IG as he is doing big things in the culinary world here in San Diego.